I am a part of the 60's revolution. Of course, there is much more which influenced that period and the decades since, but I trust the irony of the reality is not lost for you. This apparent conflict of ideals was lost on many as efforts went forth to bring change to our way of life through the use of this means to achieve the desired end. The stress of such cognitive dissonance maintained throughout a generation resulted in a continued degradation of society which only now is beginning to be noticed. The legacy of such a tussle between opposing forces is evident in the current psychological state of society at large. While every generation has sought its meaning and purpose by building and improving upon that which had gone before, the current generation has nothing but shifting sands upon which to build. This does not bode well for our future as a people, as a nation, as a global society. The guiding mantra of that generation was "question everything." The resulting staunch individualism has left a generation adrift with nothing solid with which to anchor their wandering souls. "Every man doing that which is right in his own eyes" (Dt. 12:8; Jdg. 17:6; Jdg. 21:25; Pro. 12:15; Pro. 21:2) may seem like an evergreen utopia to which we all should aspire, but without a foundation from which to direct our sense of "right," we will only realize confusion. In other words, look around. Observe. You can see the rotten fruit of such an approach. Rebelling against "what is" seems to be a necessary part of coming of age. It has certainly been the legacy upon which this country was founded. In the ordinary course of things, this rebellion is what brings about necessary change to a stolid but dying order. However, when everyone is doing that which is right in their own eyes, there is no established order against which to rebel. These are each minor skirmishes with no broad-reaching focus. And, there can be no broad-reaching focus, because when everyone is doing that which is right in their own eyes, there is an amoeba-like quality that defies definition of form. Because there is no definition of form, there is nothing to which an isolated human being can belong with any sense of security. When these types of negatives begin to arise within a people, hopelessness increases, which exacerbates the suicide rate. In today's society people need to know who they are. They have no sense of identity. That's why we sing those songs. This is not the place to go into all the ramifications of praise and worship. However, the very idea of "why we sing those songs" is at the root of our problems as a society, let alone as the Church of the Lord Jesus Christ. Psychologist Abraham Maslow defined a hierarchy of needs, with the particular revelation that when lower level needs are not met, then higher-level needs will be abandoned in favor of shoring up the deeper needs. To the right is a common graphic representation of Maslow's Hierarchy. 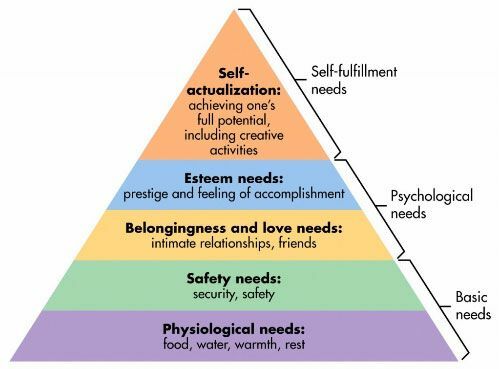 Notice the very top of the pyramid of needs—Self-actualization. Maslow theorized and research has shown that unless the lower needs are sufficiently met, the higher needs will be abandoned. What is the "need" that has been most promoted for at least the last decade if not longer? Would you agree with me that it is "Self-esteem?" Society recognized the prevalence of low self esteem and set out to rectify the situation. The caricatures of, and slams against, "participation trophy" highlight the emptiness of our collective attempts to raise the self-awareness of the next generation. "Successes" are the result of having done something. Profound, when one considers how many parents and teachers have missed this reality. 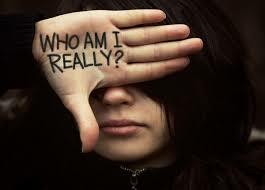 Telling people "who they are" will not result in identity awareness anymore than telling people they are great resulted in higher self-esteem. It is a need that must have a basis for its fulfillment. That basis is now non-existent in our society as a direct result of the short-sightedness of my generation—"If it feels good, do it; just so long as you don't hurt anybody." I will close with the following video, which puts a finger on the current problem and a possible solution.